The Woodstock West: Build Not Burn blog will track the progress of this documentary film project and will ruminate on all things filmmaking. 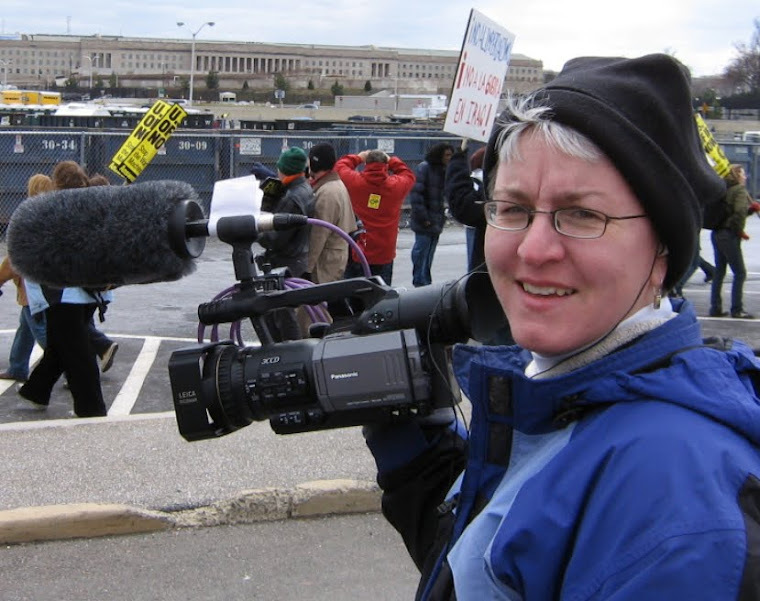 With the Pentagon in the background, I pause for a quick shot at an anti-war rally in Washington, D.C. I was shooting footage for my last film "SoleJourney" (available through First Run Features). Spring has many rituals. In Denver, for instance, April is tulip time. And I know that when spring rolls around each year, I will find myself speaking to students in the Culture, Gender, and Global Communication course offered by my colleagues Drs. Margie Thompson and Maria Suarez Toro. This spring was no exception, but the topic this year was different. Students in the course study a variety of subjects through readings, class discussions and a variety of guest speakers with first-hand experience to match the theoretical work being studied. 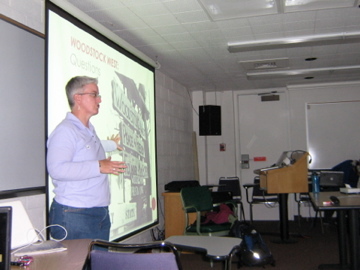 Not only was I presenting my film, Woodstock West: Build Not Burn, but I was using the topic to speak to some of the key issues in the class: How do the media portray outsiders and activists? What kind of narratives develop around resistance especially political resistance? How is social justice debated in the public? These are just a few of the questions framing the discussion for these students. For me and my work with the film, I'm interested in many of these same questions. Our on-going research has been fascinating and telling. For instance, I recall one article in one of the local newspapers covering the end of Woodstock West. A police officer is quoted telling the reporter not to call the Woodstock inhabitants 'bad kids.' He said all his interactions with the students were positive. It's obvious that this officer wanted a new narrative to be written about this group of student protestors. His direct experience led him to understand the student cause on a level different than what he was used to in the media. As a filmmaker and as an activist I readily believe that the greatest and most lasting social change happens when we tell each other our stories and when we listen to and experience the stories of others. This has happened time and again with my last film, SoleJourney, which highlights personal stories rarely heard in the media about lesbian, gay, bisexual and transgendered people. Over and over again we heard comments from filmgoers who said things like, "I've never seen a family with two gay fathers." "I've never known a lesbian grandmother." It is in these moments of genuine human sharing that we recognize the humanity we have in common. When I think about rumors or urban legends, The Beatles immediately come to mind. You’ve heard the rumor about Paul dying that sprang up at various intervals after his car was involved in a 1967 traffic accident. People dug up all kinds of “proof” of this. Perhaps most well known is the interpretation of the “funeral procession” on the cover of Abbey Road http://en.wikipedia.org/wiki/Paul_is_dead. Well, the Woodstock West encampment dealt with several rumors as well. In fact, the students set up a Rumor Central designed to keep a lid on unfounded information. This seemed to help limit hysteria and maintain the peaceful vibe. We’d love to hear from anyone with knowledge about these rumors that surfaced in the Chronology of Events written by Jim Wagenlander who was a student senator during Woodstock West and deeply involved in the matters of the day. Dynamite is buried somewhere in the Woodstock West encampment. 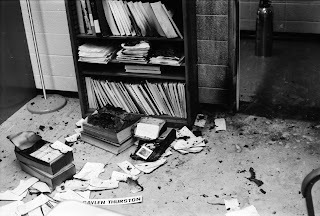 There was never an explosion at Woodstock West or on campus. 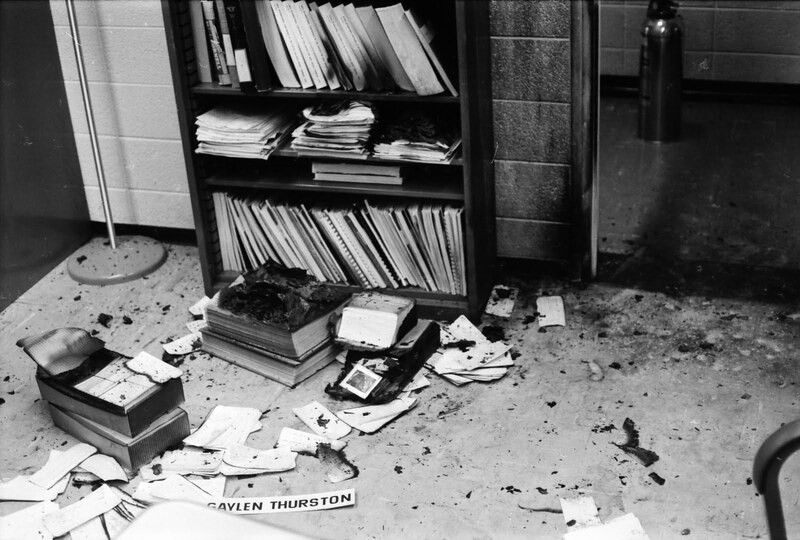 There was, however, a pipe bomb tossed in the John Greene office window of Professor Gaylen Thurston. We at WW wonder why his office was targeted and who might have done this. 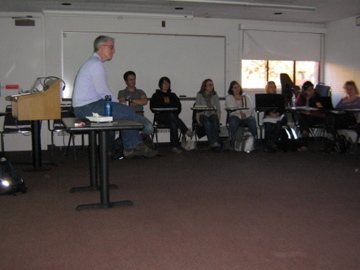 We know that students were not happy the Denver Research Institute (DRI) was operating on campus. This was part of a larger national protest agenda by Students for a Democratic Society (SDS). SDS was working to get universities to divest of any military-oriented research. While evidence suggests the local SDS chapter was told DU was not involved in military research, former DRI employee, and later its acting director, Dr. Anita West, told WW that indeed DRI was actively involved in military sponsored research. Someone contaminated the water supply with LSD. At a meeting called to plan the all-campus convocation addressing DU’s response to the Kent St. murders and Nixon’s announcement that covert operations in Cambodia had taken place over the last 13 months, Dr. John Blackburn, Vice Chancellor of Student Affairs is called out into the hallway. He is informed by a student who that LSD has been put in the drinking water. Dr. Lewis Barbato, director of DU’s Health Services is called to campus and local hospitals are notified. Student Marshalls, under the direction of Dave Sborov, line up several vehicles along the student union to help transport fallen campus members, but nothing ever developed. James Taylor played at Woodstock West. "James Taylor made a surprise appearance." By definition, rumors are ‘a story or statement without confirmation or certainty as to facts.’ So, I’m not so sure this is a rumor or just something we’ve not been able to absolutely substantiate. 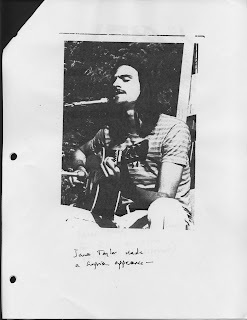 We have one photo of JT playing a guitar and singing, but the lack of context suggests this could be anywhere. The photo was copied and given to WW by supporter Cindi Pittman who has since died. We’ve had one eyewitness, Malcolm Hirsh, so far say he was there when JT got up and sang one song for the gathering. But, when we passed the photo along to JT through his “people” they responded that Mr. Taylor did not wish to comment. Can anyone substantiate this rumor? Did James Taylor share his musical talents with the Woodstock West crowd? If anyone out there reading this has any other rumors they want to pass along to us or can help debunk or confirm any of the above rumors, let us know. We’d love to hear from you! We've talked via phone, over coffee and during lunch and dinner to lots of folks with first-hand accounts of Woodstock West. These include presidents and members of the University of Denver chapter of the Students for a Democratic Society (SDS), former directors of the Denver Research Institute, students who built shelters on the Woodstock West site, members of the Clarion, faculty and staff. We've connected with the DU Retiree Association and published an article in their newsletter that led to many leads. I'll be teasing the project at their April 20 luncheon and will be giving a full presentation in October to the group. We also received many inquiries after Don Oppliger published a blurb about the project in the Mathematics Department newsletter. Thanks a lot Don! Numerous stories have been posted to this website from folks who remember Woodstock West. Many thanks to those of you who have contributed! We encourage those of you reading this blog post to take a look at the fascinating stories and add your own. We have worked with two different groups of students in Professor Nadia Kaneva's Strategic Communication courses to do primary research for an activism on campus video contest we're going to launch in conjunction with the film's completion. 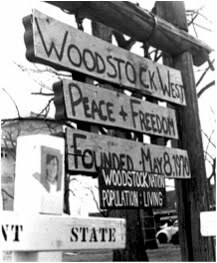 With the video contest we hope students on college campuses today will submit short films about peers who are carrying on the spirit of activism that was found in some of the students from Woodstock West. We have organized and started culling through the thousands of documents from the Penrose Library Woodstock West Collection. A big shout out to Archivist Steve Fisher who continues to be a real help! We have received and continue to work on a song submitted to us by Ray Smith, a Canadian, who was in Denver during Woodstock West. Ray's story is in the story section of this website. He calls Woodstock West a defining moment in his life and he was so moved by the story that he wrote a song appropriately titled, "Build Not Burn." Stay tuned for more information on the progress of this song! Speaking of music, we connected to bass guitarist, David Givens, formerly of the Boulder-based band Zephyr. Zephyr, according to Ray Smith, was the real sound of Woodstock West. David has given us permission to use some of the Zephyr recordings in our film. A huge thank you to David! We have scanned hundreds of photos from the Woodstock West library. We have had wonderful conversations with Terry and Steve Datz who, in 1970, created a photo booklet of the protest they called, "WoodstockWest: Five Days of Freedom." Sold through the Clarion and an ad in The Berkeley Barb, the booklet sold for $1.50 and launched their publishing company, Matchless Publishing Co.
We had an opportunity to do our first on-camera interview with Professor Bob Amme who, in 1970, was taking over as President of the University Senate at the time and was part of the executive council that was trying to broker a peaceful end to Woodstock West. In February I went on a self-imposed writing retreat to work on an important grant. I made a great deal of headway and submitted the grant. Because of the exceptionally competitive nature of arts grants, I'm not holding my breath, but just submitting the grant was a great step forward in clarifying the film and the larger goals for the project. I did find out that a proposal written for a conference in Montreal, Canada was accepted and I will be there for five days in May talking about a relatively new phenomenon in documentary production, the I-doc or Interactive Documentary. I-docs use an interactive platform like the internet to help tell their stories in new and interesting ways. See the award winning Prison Valley as an example of an I-doc. These are just a few of the many items we've been working on since last fall. I have to say that I'm really overwhelmed by the willingness of folks to share their stories in writing, in person and over the phone and e-mail with us. We have much to be thankful for as your generosity is truly amazing. I'm working at being a more disciplined blogger and hope to create a new entry each and every Monday. Please feel free to link, post, and pass along this blog to interested parties. The sabbatical has kicked in and I've hit the ground running. The University Film and Video Conference I referenced in my previous post was a great place to toss out some ideas about our audience engagement and audience building strategies and it was a terrific venue in which to hear others talk about these topics. I want to review some notes from a workshop given by filmmaker, author, entrepreneur, Jon Reiss whose film Bomb It has been a great laboratory for gaining critical information about independent film distribution, audience engagement, marketing and outreach. I'd also recommend his book, Think outside the box office. The ultimate guide to film distribution and marketing for the digital era. Here are a few things that I found most important. The old Hollywood studio model for releasing films never worked for indie films. A new model has arisen and the good and the bad of that is that each film requires its own blueprint. While we may draw principles from each other, we need to understand our film and our audience(s) and figure out how to get to them. This new model requires indie filmmakers to redefine film rights. We need to focus on a split rights strategy. For instance, we can parse out live event rights, festival, theatrical, merchandise, digital, foreign, and mobile rights to different folks to maximize revenue and to work with specialists who know these areas intimately. This replaces the one stop shopping of handing over all rights to one distributor who may not have expertise in one or more area and will not be working in your best interest. Reiss talked briefly about pitching and offered this advice on what a pitch to investors should accomplish: "Inspire greed. Alleviate fear." I suppose the agent of social change in me has a little trouble with the first, but if we're talking about serious investors it makes sense to talk to their pocket books. They haven't come to the pitch to see my outfit. In this day and age of apps, it's not a bad idea to have your short turned into a widget. Adding to that, why not serialize your longer film, doc or narrative? Integrate your audience into the filmmaking process. This can begin at a place like Kickstarter where people are directly funding your project. You can also offer a pre-sale of the DVD. Of course you can build this audience through social media like Facebook, Twitter, Flickr and through a blog (like what you're reading here). In my next installment I want to toss out some ideas that have been simmering and see if I can get some discussion going. In the meantime, we're about t-minus three weeks for the launch of our website, www.woodstockwestthemovie.com. In the meantime, check in on our Facebook page. I'm at the University Film and Video Conference for the next few days, and I'm looking forward to learning a ton from the talented teacher/filmmakers who attend this extravaganza. Along with two colleagues I met last year, Casey Hayward and Claire Darby, I'll be presenting on my developing strategy to distribute my film. I call this "The Cart Before the Horse Distribution and Outreach Strategy" but it seems there is no longer a horse or a cart when it comes to building momentum for independent films these days. Let me explain. With previous films I completed, my "strategy," if you want to call it that, to get my films seen was to write checks to festivals, fill out the paperwork and create a sweatshop in my office comprised of mailers, festival paperwork, return labels and DVDs (or VHS tapes in the early years). Then I would hope to get in a festival. And wait. There was a lot of waiting involved. So, how am I using these things to assemble my strategy? Stay tuned...I'll be working on this at the conference and will report back next week as I do my own thinking about this and pick the brains of the brilliant minds around me here in Vermont. No doubt you're asking yourself, "What is Woodstock West: Build Not Burn?" The simple answer is that it's a feature length documentary. The more complex answer is still evolving. As a documentary filmmaker with five completed films behind me, I've rarely known in the beginning stages of a project just how a film would turn out, what exactly it would be about, what themes would be important and who would be central to the storytelling. Such is the case with my latest project. Early on in my filmmaking career, this kind of ambiguity or unknown path was disconcerting, but now I know it's as much a part of my process of documentary filmmaking as pulling my camera out of the bag. this iconic Woodstock West image. Here's what we're saying about the film now: What do a shanty village, bulldozers, the draft and the National Guard all have in common? Woodstock West: Build Not Burn tells the story of a 1970 University of Denver protest and explores the impact this "fight the power" moment had on the lives of young people who tried to change the world. What I hope to chronicle in this blog is my process of making the film. You'll come with me as I dig through the archives. You'll look over my shoulder as we fire up the camera and turn on the lights to do an interview with a student leader during Woodstock West or a professor or a police officer or a national guardsman. You'll see inside the process of acquiring music, images and film footage. You'll travel with us to different parts of the country and hopefully different parts of the world as we track down some of the key players from Woodstock West and try to find out how this moment in 1970 did or did not influence their life choices after they left Denver. As work feverishly takes place on the Woodstock West: Build Not Burn website by the programmers and designers of Open Media Foundation here in Denver, I'm working on several other elements of our on-line strategy. I'll be talking about this work at the upcoming University Film and Video Association's national conference in Burlington, VT and will also share the process here on the blog. So, I you're interested in how a documentary film comes together, stay tuned! We'll discover Woodstock West: Build Not Burn together! Sheila E. Schroeder is an independent filmmaker and university professor. She's currently working on a feature-length documentary Woodstock West: Build Not Burn about a 1970 campus protest that turned tragedy into hope...for a lifetime.